Why are businesses cutting corners when it comes to investing in tech? Businesses risk being held back by failing to invest in tech. How can the hurdles be overcome to give staff the tools they need? 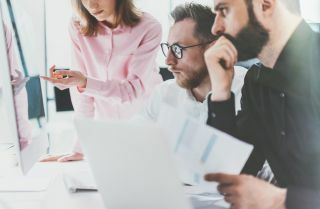 Almost half of UK are firms (48 per cent) are delaying investment in technology for their sales teams because of concerns over cost, according to the SalesTech report by CITE research and SugarCRM. Deploying tech to a workforce, as we know, can be expensive and complex; our research found that nearly a quarter (22 per cent) of UK companies spend at least £2,400 per sales employee. While it’s great to see that investment is being made in some quarters, the vast number of companies that are spending less than this level is indicative of a widespread reluctance to invest in the technology that could, after all, improve the effectiveness and productivity of sales teams. On the face of it, this position might appear to be somewhat self-defeating, so I think it’s useful to examine some of the reasons contributing to a stagnation in tech investment. Businesses face a catalogue of in-house challenges when it comes to using technology. Our research found that 63 per cent of firms are worried about the cost and effort needed to keep systems up to date. The figure reflects that many businesses still rely on legacy IT systems, because it’s simply too costly to continue to update them. There’s a common perception that a new system is always going to end up costing more than its ticket price. In today’s fast-changing landscape and as employees increasingly expect consumer-grade, user-friendly technology, it’s natural to be concerned about projects escalating. Worries about training, time lost to the inevitable learning curve of new software, as well as more basic factors such as user adoption are all contributing factors to nervous investment strategy. After all, regardless of the economic climate, no business is going to risk poor return on investment or, worse still perhaps, a botched deployment of a new system. Ultimately, this can lead to even higher scrutiny and delays on investment budgets until the old technology delivers returns. No wonder many IT pros feel like they’re stuck between a rock and a hard place. It’s not a huge surprise therefore when some employers fall back on a “if it ain’t broke don’t fix it” approach and persist with legacy systems long after they’ve been surpassed by the capabilities of alternatives. With tightening budgets, why invest in new systems when old tech can still deliver results? These attitudes, while completely understandable, are in danger of obscuring the benefits that new tech solutions can bring. Businesses need to empower their employees and promote digital tools as means to boosting productivity rather than just a useful ‘add-on’. When employers remove their staff from the sidelines and encourage them to actively use technology, gradually the benefits should become self-evident. The key is in finding tech tools that are easy to deploy and can demonstrate results quickly, while being simple to change and maintain along the way. If the tools are easy to use, employees can get to grips with them immediately, motivating and empowering them to do their jobs better. Get this right and they’ll stick around a lot longer. The SalesTech report also highlighted how a lack of skills could be holding businesses back from investing in technology. Since the global financial crisis of 2008, the tech industry has been essential to the UK’s economic success, with a report by Tech UK highlighting that the sector is growing 32 per cent faster than the rest of the economy. It has been responsible for creating high-skilled, high-value jobs across the country and has been vital to UK’s improved economic outlook. But with Brexit negotiations underway, concerns have been raised about how this skilled workforce will be maintained in the future. According to Tech UK, 18 per cent of the UK’s three million tech workers were born overseas, a figure that suggests that a considerable amount of the UK’s success stems from a skilled foreign workforce. Brexit has inevitably raised worries about who has the skills to develop and deploy technology. Research by Coleman-Parkes suggests that 58 per cent of UK businesses felt that the changing political climate is their biggest challenge – and almost all (94 per cent) said Brexit has affected their decision making. The UK’s reliance on a foreign workforce has led to a widening skills gap in the UK, with many employees and employers lacking technological expertise. A report by the OECD notes that just 16 per cent of students in the UK graduate with a degree in the field of sciences, a figure that reiterates the lack of STEM fuelled subjects in the UK. The absence of inherent tech skills in the UK is yet another challenge for deployment in Britain. Our research maintains this view, with 34 per cent of respondents feeling worried about the complexity of introducing new tech systems and 20 per cent concerned about a lack of skills in using the tools. This will take some investment in training and upskilling, but will reap rewards in the longer term. Today, technology is a critical element in driving business growth and productivity, especially as there are very few processes in the average workplace that haven’t been transformed by digitisation. From the basics like a smartphone, tablet and laptop, to a modern CRM system and tools like web meeting and collaboration platforms, keeping up to date with technology and knowing how to properly use it needs to be a priority for any business, especially those that are customer-facing. Yes, the recent political shift has caused a stir, but to overcome this the UK needs to invest in tech and equip everyone with the skills to use it. After all, when mundane tasks are automated, workers are happier, more motivated and better able to focus on the more worthwhile activities that allow businesses to truly prosper.